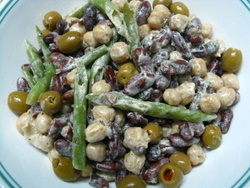 A three bean salad is a very healthy salad recipe. It is best served cold. Very quick and easy to prepare. Full of taste and nutrition. Prepare the dressing by mixing all the ingredients well and keep aside. Blanch the french beans by boiling in salted water for 5 minutes and running under cold water. If you want you can steam them instead. Drain and rinse the red kidney beans and the chickpeas.Tip them in a bowl, along with the french beans. Add the salt and pepper. Mix gently. Add the dressing and stir gently to coat all the beans. Garnish with the olives.Cover and let it stand for 1-2 hours in the refrigerator.